So, this is an adaptation of the 1967 animated version of The Jungle Book; it isn't really an adaptation of Rupyard Kipling's stories (beyond a few extra characters and a few additional nods), so don't go in expecting that. Maybe that's what Warner Bros. will end up doing. I don't know. However, it's not a straight adaptation of the cartoon; it's not the original Disney movie with a live action Mowgli all the sudden. This movie begins a bit earlier than the cartoon version; during a time of drought, all the animals of the jungle come together in truce to drink at the last remaining water sources. Because of this, Shere Khan (voiced by Idris Elba) discovers the existence of Mowgli (newcomer Neel Sethi), and not being a fan of humanity, announces as soon as the water truce is over, well, Mowgli's in trouble, as well as anyone who tries to protect him. The depiction of these two characters, the tiger and the man cub, are where most of the main changes in the story you are probably familiar with lie. In the cartoon, the wolves elect to basically kick him out of their wolf pack; here, Mowgli makes the decision himself (and, also, the wolves have a much bigger, and more sympathetic, role). Shere Khan, meanwhile, at first appears to have a reasonable grudge with humanity, rather than just an apparent taste for human flesh; he was blinded in one eye during an encounter with a human (though a flashback adds further layers to this encounter). Ultimately, Shere Khan is portrayed as a petty tyrant, which actually allows him to be a rather effective villain. The movie also seems to go out of the way to have characters react with surprise to the revelation Mowgli is being hunted by a tiger, only to have an, "oh, that guy" reaction to being told which tiger. Meanwhile, the relationship between Mowgli and black leopard Bagheera (voiced by Ben Kingsley) is fleshed out; in the cartoon, it's never really quite clear why Bagheera is the one taking Mowgli back out of the jungle to his fellow humans. Here, the movie makes clear that Bagheera sees himself almost as Mowgli's surrogate father, and that it was his decision to save Mowgli as a toddler wandering around the jungle. Mowgli seems to collect father figures; in addition to Bagheera and his wolf dad, the part of the "cool dad" to the panther's "stern dad" is, of course, Baloo the bear (voiced by Bill Murray), a bit of a con artist who at first just sees Mowgli as a guy who can get him some honey, but soon begins actually care about him. He encourages Mowgli to use his human "tricks," while Bagheera admonishes Mowgli that "tricks" are not covered in the "law" of the wolf pack. Bagheera, however, is not very good about getting Mowgli out of the jungle; Mowgli has multiple misadventures, including an encounter with ginormous and hypnotic python Kaa (voiced by Scarlett Johansson), in what is basically a walk-on cameo (kind of impressive for a vocal only performance of a character with no legs). Kaa basically appears because there has to be a Kaa scene; it's good (and the snake's hypnotic powers are used to reveal an important flashback), but still feels a bit like checking off a box of things that must happen. Better is the appearance of King Louie (voiced by Christopher Walken), who is no longer an orangutan (which apparently don't live in India, so that would be unrealistic), but instead a Gigantopithecus, an apparently extinct giant ape that some theorize survived to modern times as the Himalayan yeti (so, you see, much more realistic). Walken plays the part more like a gangster kingpin than monkey king; he's basically offering Mowgli a protection racket in exchange for the secret of fire, which of course Mowgli doesn't know. The movie is barely a musical; King Louie and Baloo get there signature songs, but that's it. The movie takes a radical departure from the ending of the cartoon; Mowgli has much more say in what happens to him this time around. 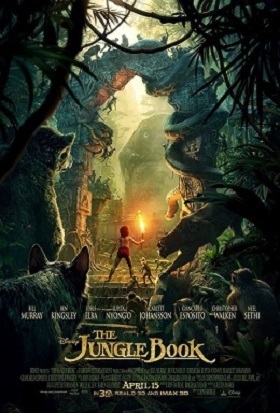 In fact, all in all, Mowgli's character is well served by this movie, and Neel Sethi holds his own against a menagerie of Oscar winners, Oscar nominees and Oscar should-have-been-nominees. Mowgli greeting Baloo and Bagheera with a simple "Hey, guys!" may be one of the best lines of 2016; it's the perfect punchline to an amazing scene involving a herd of elephants that best encapsulates both the character of Mowgli, and the character of the movie. This movie is surprisingly good. It sneaks up on you; it's not a movie you go into expecting to really like the way you end up liking it. It's a movie you expect to go into and have fun. And it is fun. But it's also surprisingly smart. In many ways, it does feel like a reaction to the 1967 version, rather than just a remake, and that's surprising because that was not a movie that feels like it needed a reaction to. But the truth is, in retrospect, it's surprising how much more I liked Mowgli in this movie than in the cartoon version. This version fleshes out both the protagonist's character, and his relationships with the supporting characters, and that is an improvement. Baloo the bear played by Bill Murray is great; but what makes this movie good is that, at the end of it, he doesn't steal the movie out from underneath the character the movie is actually about, this time. I enjoyed the movie but I felt the songs were a bit out of place. In addition to realistic animals singing looking weird, the movie feels a little too serious for them. I agree with brian577. The songs felt intrusive, and they took me out of the environment the film was trying hard to create. And who in their RICE PICKING mind decided it would be a good idea to have Christopher Walken sing??? My own take? The movie was beautiful, amazingly rendered -- both in terms of textures and animal motion. It once again set a new standard for what a CGI/Live Action hybrid can do. BUT... the attempts at humor were either eyeball rolling droll, or more often just plain not funny. And quite frankly I think I could have written better, more interesting dialogue in my sleep. Does a shiny green Central American jumping spider look anything like Bagheera in “The Jungle Book”? No, but its scientific name is "Bagheera kiplingi", the result of being discovered & named in 1896 by two scientist fans of Kipling’s books, George and Elizabeth Peckham. They also discovered and named other jumping spiders that they named Akela, Messua, and Nagaina, after Mowgli’s wolf father, the rich Indian woman who adopts Mowgli, and the female cobra in “Rikki-Tikki-Tavi”.